Jason Aldean is coming back to Ak-Chin Pavilion on Saturday, September 26, 2015. We may be lucky enough to hear a songs from the new album he is working on. Jason celebrated the success of his recent three consecutive number one hits, “Burnin’ It Down,” “Just Gettin’ Started” and “Tonight Looks Good On You,” off of his PLATINUM record OLD BOOTS, NEW DIRT this week (8/11). 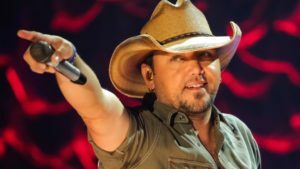 Aldean is a natural born crowd-pleaser and entertains as if he was part of the audience. He spurs, no pun intended, his audiences, or shall we say he commands them, to sing and dance. CLN always looks forward to attending this style of a country music concert, as the audience is always ready to get their “country on”, it’s the country way! We can’t forget Cole Swindell, the opener for Aldean. His hit single “Chillin it” has enjoyed a great ride on the country music charts. It’s hard to believe that Swindell was selling merchandise for Luke Bryan’s concerts just three years ago. Once he landed a staff writers gig for Sony ATV, his songwriting and singing took off. Come on down to Ak-Chin Pavilion on September 26th and join in on the fun! Get tickets here.